I gave yoga a try for a little while during the winter. I was going to the 7am classes at my gym three times a week. They didn't seem that effective to me. I ended up concluding that an hour on the treadmill would probably do me more good. I'm more concerned about weightloss than I am flexibility. I may not be a yoga fan, but I am a Smart Water fan. To each his own. Those of you that are yoga people - you'll be happy to know that there's going to be a couple of free yoga classes this upcoming Thursday 5/8 held in Copley Square. The first class is at 12pm and the second class is directly afterwards starting at 1pm. So get out your best pair of stretch pants, inhale, exhale and come showoff your downward dog! 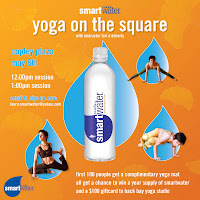 The first 100 people will receive their very own yoga mat, but everyone will have a chance to win a year supply of smartwater and a $100 gift card to Back Bay Yoga Studio. So come take a break, don't fight it, get into your warrior one stance and get a kick in the pants with electrolyte enhanced smartwater. Email to sign up now: laura.smartwater@yahoo.com. 0 Response to "Free Yoga @ Copley Square - 5/8"